Plot: A police detective reconnects with people from an undercover assignment in her distant past in order to make peace. Starring: Nicole Kidman. 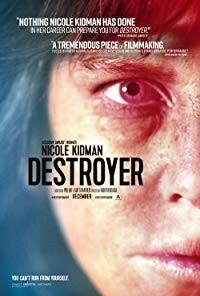 distributed by Annapurna Pictures «Destroyer» in the US movie theaters released on December 25, 2018 and has grossed over $1 million worldwide; dvd and blu-ray release date was set for April 23, 2019. Rent from Netflix and Redbox from April 23, 2019. «Destroyer» in the UK released in movie theaters on January 25, 2019. DVD and blu-ray release date scheduled for May 27, 2019.